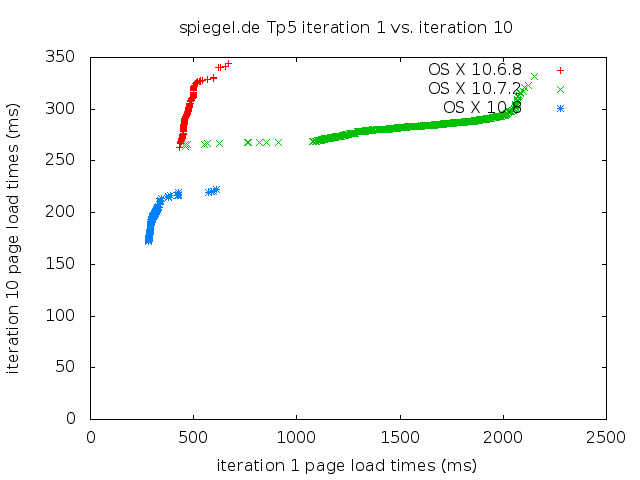 I’ve been looking at some Talos pageload benchmark data lately. 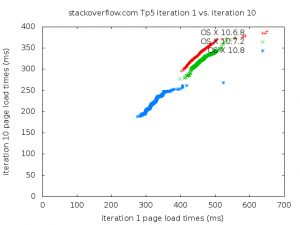 The intention is gleaning enough information to decide whether having a separate cold page load benchmark is worthwhile. Our Talos pageload benchmark loads a number of sites a specified number of times (currently 25), records times for all of those, discards the highest time per page (usually the first page load), and averages everything else. 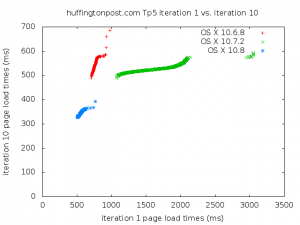 The working hypothesis is that the 1st and/or 2nd iteration of each site load might be worth tracking separately. 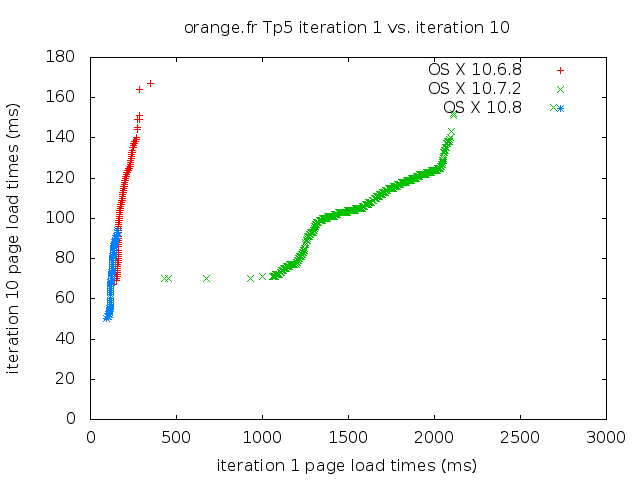 Plot numbers from step 1 vs. numbers from step 2 and eyeball the graph. 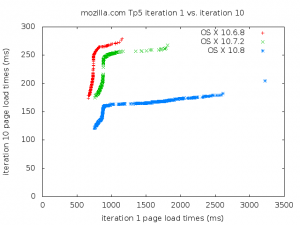 These sorts of graphs are exactly what you’d want to see across OS versions: improving load times along warm page load, cold page load, or both. I’ll show a few representative graphs here; you can examine graphs for all the sites in the benchmark if you wish. 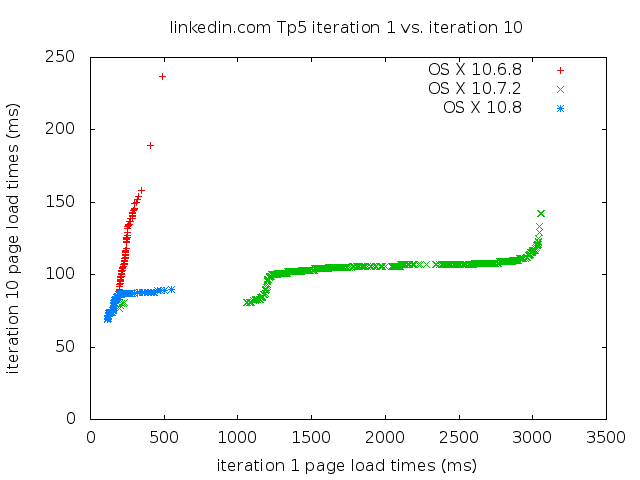 What’s so interesting about these graphs is that the maximum cold page load time for OS X 10.6 and 10.8 is barely the minimum cold page load time for OS X 10.7. 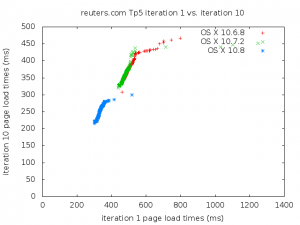 The warm page load times are similar, too. 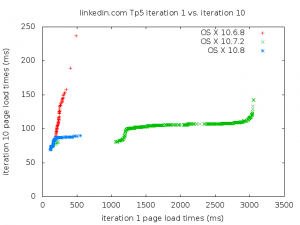 I’m probably not going to dive any deeper on this issue right now; instead, this discrepancy will get filed away under “interesting things that turn up when you look at cold load performance specifically”. 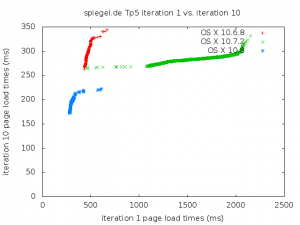 Once I reach some sort of conclusion on whether benchmarking cold page load separately is worthwhile, then I’ll come back to the interesting issues found along the way. 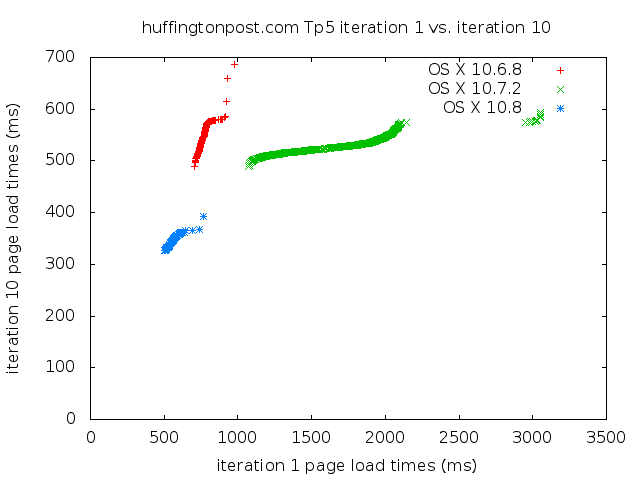 If anybody has any theories about why these pages exhibit this discrepancy, I’d love to hear them! This entry was posted on Thursday, April 18th, 2013 at 5:04 pm	and is filed under Uncategorized. You can follow any comments to this entry through the RSS 2.0 feed. Both comments and pings are currently closed. Took me a while to understand the graphs. 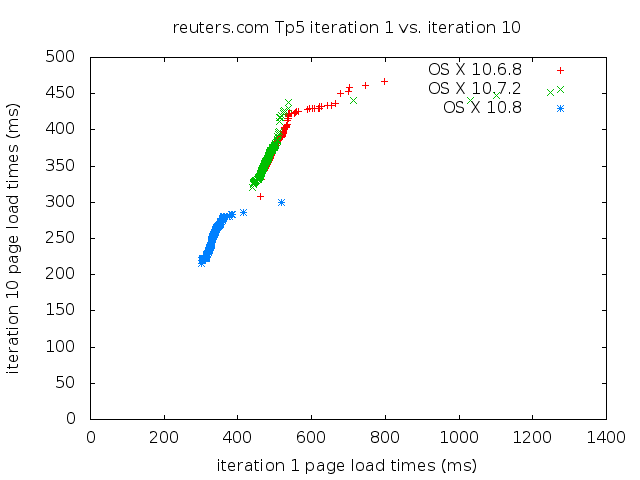 Each dot is a specific website where y is warm speed and x is cold. Did I get that right? I wonder if a-team changed how they image machines or if it really is a difference in firefox perf. 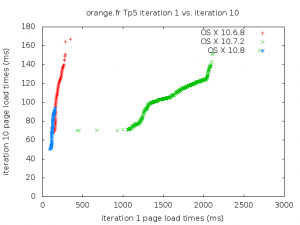 Wonder if we can get a similar picture through necko telemetry. Yes, you interpreted the graphs correctly.